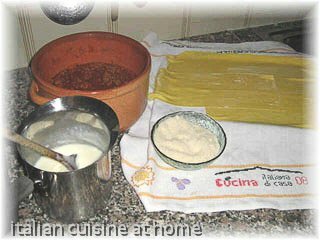 the lasagna alla bolognese are without any doubt one of the most world famous and appreciated recipes of Emilia. Notes to the recipe: Due to their magnificent look and to the long time required for cooking lasagne alla bolognese are considered a Sunday and for celebrations menus recipe, you should only not to be hurried: the secret is to simmer the ragout during many hours, for a best blend of flavours and consistence. Regarding pasta a famous cook of Bologna said that "the pasta must be as thin as you can see San Vitale through". San Vitale is a church on a hill of Bologna...Don’t worry for the long cooking time, you can prepare the ragout one day before serving. Se recipe for ragout bolognese.